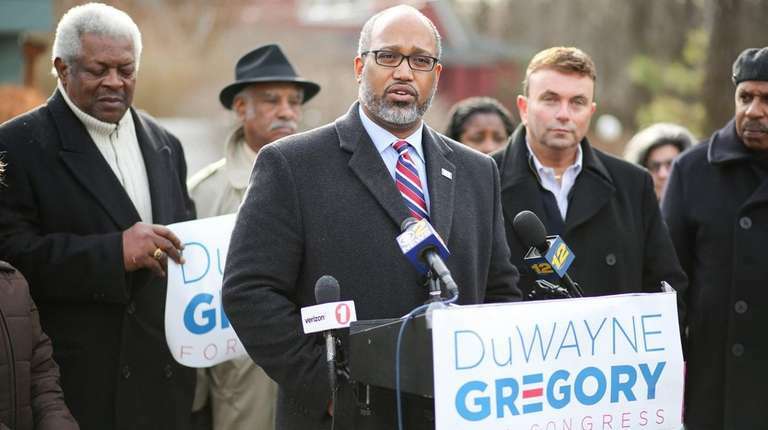 Democrat DuWayne Gregory, presiding officer of the Suffolk County Legislature, announced Tuesday he will seek to challenge Rep. Peter King (R-Seaford) hoping to ride a backlash against President Donald Trump and Republicans. Gregory said the 2nd District, which covers the South Shore of Suffolk and Nassau, needs a congressman willing to challenge the president, whom he described as divisive. “It’s time we had a representative who stood up to the extremist leadership in Washington, D.C.,” Gregory, 48, of Copiague, said as he stood in front of a supporter’s house in Central Islip. 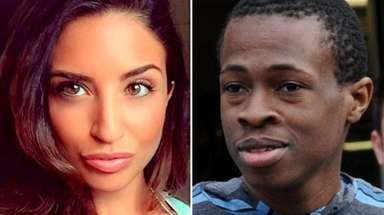 Gregory faces a Democratic primary against activist Liuba Grechen Shirley, who has raised $120,000 from small donors this year. “I look forward to a spirited campaign and to sharing my progressive vision for the district with Long Islanders,” said Shirley, who formed the group New York’s 2nd District Democrats after Trump’s election. Gregory called King “ineffective” for failing to block the Republican tax plan signed into law last year. The law reduces the state and local tax (SALT) deduction, which Gregory said will hurt Long Island homeowners. King voted against the bill. He opposed and supported Trump depending on the issue, he said. “I stand up to him when I have to and support him when I have to, same as any other president,” King said. King said he was outspoken against eliminating the SALT deduction, and that he and others lobbied successfully against a provision that would have eliminated the deduction. The final legislation capped the deduction at $10,000. “I don’t win every fight, but I do win an awful lot of fights for the district, from Sandy to 9/11 health care to MS-13,” said King. Gregory ran unsuccessfully against King in 2016, losing 38 percent to 62 percent. He raised about $376,000 to King’s $1 million. King had $2.7 million cash on hand in October, according to the most recent filing with the Federal Election Commission. Gregory had $3,473 left after the 2016 campaign; he hasn’t yet had to file report for the 2018 election cycle. Gregory said that the mood of the district has changed in two years, with many voters unhappy with Trump’s “divisive rhetoric” and the Republican tax bill. Political analysts said 2018 is looking better for Democrats nationally, but unseating King will be a tall order. “If there’s a big Democratic wave building against Republicans, as most analysts seem to think, Peter King will be one of the last Republicans in an arguably swing district to be washed away,” said Lawrence Levy, executive dean at the National Center for Suburban Studies at Hofstra University. Democratic chairman Richard Schaffer said he’s endorsing Gregory in the primary. Schaffer said Gregory’s chances were boosted by the Republican tax plan. “The Republicans have visited probably the worst disaster Long Island has seen since superstorm Sandy,” Schaffer said. Shirley, the progressive activist, has been a leader among newly energized activists that have emerged as a local political force since Trump’s election. Gregory was elected to the county legislature in July 2008 and became legislative leader in 2013. He is the first African American to hold the post. Gregory enlisted in the Army in 1993 and later became an officer. Gregory on Tuesday touted his legislative record of providing law enforcement with tools to combat gangs and opioids, and support for environmental protection and storm preparedness.